Nicolas De Santis, President of Gold Mercury International, gave a speech on UNIVERSAL VALUES AND THE LAW during the World Law Congress in Madrid in the presence of H.M. the King Felipe VI of Spain and other international authorities. The World Law Congress of the World Jurist Association, gathered in Madrid more than 2,000 people from the international legal world and prominent figures from global civil society, to take the pulse of the most relevant issues of the international agenda. 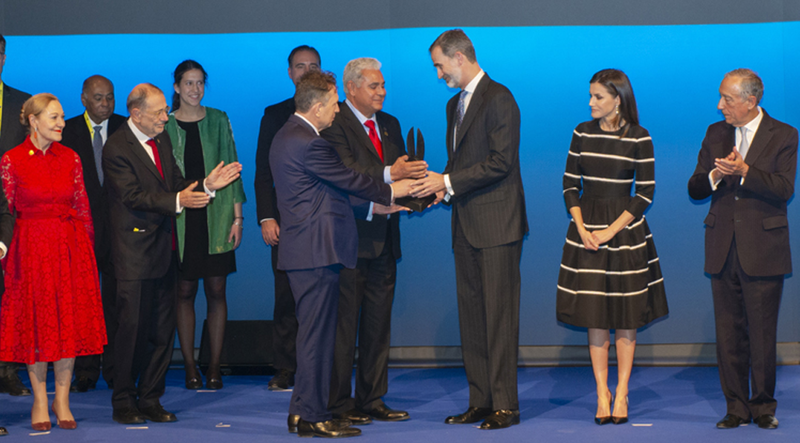 During the Congress, the WJA World Peace & Liberty Award was presented to His Majesty King Felipe VI to distinguish the unwavering commitment of King to the Rule of Law and its prominent role at the international level as a leader in the defense of Democracy and Liberty. His invaluable contribution to the soundness and strengthening of the constitutional model, democratically approved by all Spaniards, makes him worthy of this recognition, making Spain a symbol for democracies in the world, with special emphasis on Latin America and Europe. It is an honour to be here today at the World Law Congress, organised by the historic World Jurist Association, to present its new brand and vision based on Universal Values. This global event in Madrid is a historic moment for all people present here, but also for people around the world, as we will discuss the future of our planet. Today, the structures of global governance are stretched to the limit as they try to resolve global issues, such as war, poverty, forced migration, degradation of our environment, global health, protecting human rights, and defending democratic principles. As the importance of non-state actors increases, year after year, and as our global population will reach 10 billion by 2050, our planet’s resources and social structures will face even bigger challenges and risks. We, as a planetary species, will know by then if we were able to work closer together, in peace and cooperation to guarantee our own future. Within this narrative of global inter-dependence, law and justice will have to play a crucial role to support our sustainable future and create the basis for increased cooperation. We have now agreed 17 sustainable development goals of the UN, to achieve 169 targets by 2030. To this challenge, I ask of all you here today, and the legal profession around the world, to keep innovating. Jurists and philosophers thousands of years ago, started the difficult road of defining crucial concepts. Law at its very core is originated and evolved from values. I ask of all of you, to think how law and justice can continue to define, defend and consolidate UNIVERSAL GLOBAL VALUES of equality, freedom, peace, fairness, mercy, respect and dignity for the individual and nature. It is now time for me to present the new brand of the World Jurist Association.